You may think a chocolate chip cookie cannot be improved upon, but what if I told you it could just have a little bit of pizzazz by adding tahini paste? Tahini is sesame ground up, until it reaches a creamy consistency. It adds a bit of nuttiness and savoriness to your standard chocolate chip cookie without a distinct sesame taste. This recipe should be followed as-is with no substitutions and changes – even the size of the cookie and the timing has been perfectly calibrated to give the cookie a soft, chewy interior. Beware if you use silicone baking mats like I do – your cookies won’t get to a golden brown but they will be done after the designated amount of time. It’s been so long since I last updated my baking blog! But this comeback recipe would be well worth your time – it is a homemade version of my most favorite cookie ever (and I don’t use superlatives lightly) – the Tim Tam! Tim Tams are chocolate overloads in a little package. You have a chocolate biscuit sandwich with a malty chocolate buttercream filling, which is then dipped into creamy chocolate. Chocolate3! My next favorite cookie are probably Loackers and I enjoy it for the same reason I do Tim Tams – that textural contrast, mmm. Note that Tim Tams and Loackers are from Australia and Italy respectively. America, can you please step up your cookie game?! Happy to take any recommendations. Here’s a close-up cross-section of the cookie. I think what really elevates the cookie is the malted chocolate filling. I don’t even know how to describe the taste of malt. I just spent five minutes Googling it and it looks like the Internet doesn’t know either. To me, it tastes like nostalgia and afternoon snacks composed of Milo drinks and Hup Seng cream crackers. These guys know what’s up! Anyway, Whoppers (or Maltesers, for my Commonwealth folk) have a malt interior. 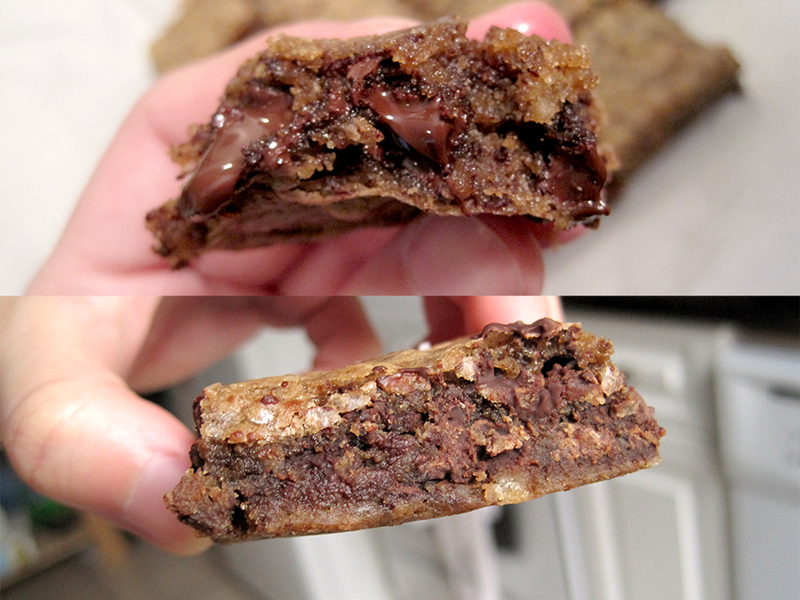 Now that I have expounded upon my love for this cookie, let me nerd out about the recipe I tried. The cookie made surely wasn’t perfect, but I’ve analyzed what exactly to watch out for to ensure utmost approximation to the original cookie. I tried both a dark chocolate and a milk chocolate coating. I used Trader Joe’s Pound Plus Dark Chocolate for the other half batch and I would recommend using more coconut oil than recommended to compensate for the lower fat content in the dark chocolate. The coating on the dark chocolate Tim Tams were more of a crisp shell than a creamy coating, which is not ideal. Use good quality chocolate to better approximate the high quality chocolate that Commonwealth countries get, i.e. not that sour chalky Hershey crap. I used American-produced Cadbury milk chocolate and that tasted decent. Try as much as possible to roll the cookies to a 1/4 inch. It’ll also help with ensuring cookie crispness. You want that nice contrast between crunchy cookie and creamy chocolate. Dip the cookie sandwiches sparingly into the melted chocolate. Otherwise, the chocolate coating ratio goes all awry. Enough talk, on to the recipe! I made very minor edits to the source. 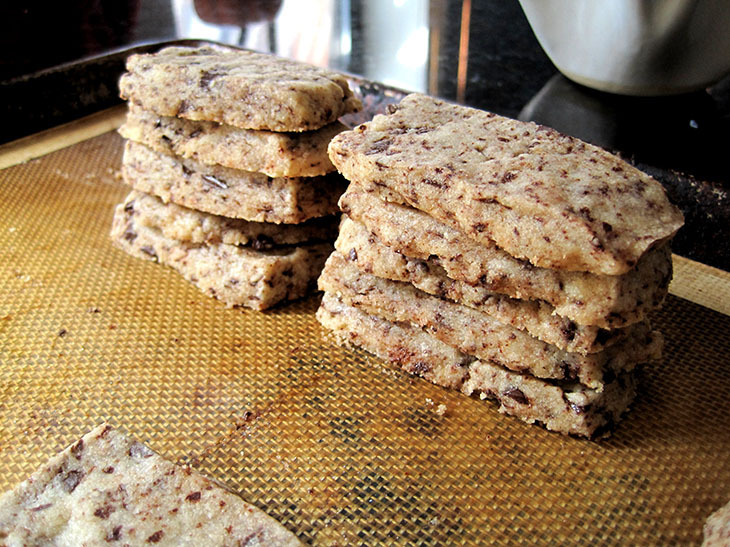 Scrape the dough out onto a piece of parchment paper. Add a second sheet of paper on top, and roll out the dough between the two sheets until it is a rectangle about ¼-inch thick. Place the dough on a tray and freeze it for 30 minutes, or refrigerate it for 1-2 hours, until firm. 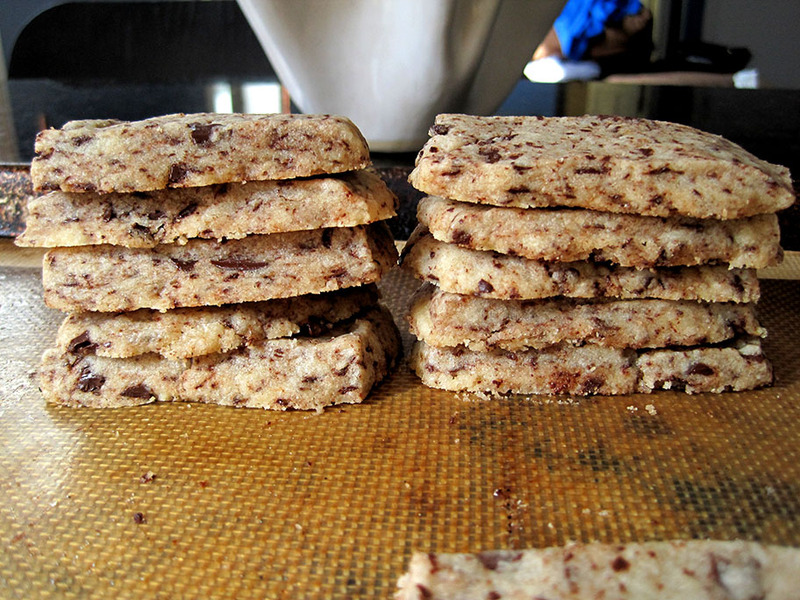 Cut the chilled dough into 28 small 1¼ in x 2½ in rectangles. Place them in evenly spaced intervals on the baking sheets and bake for 10 minutes. Let the cookies cool completely on the baking sheet. 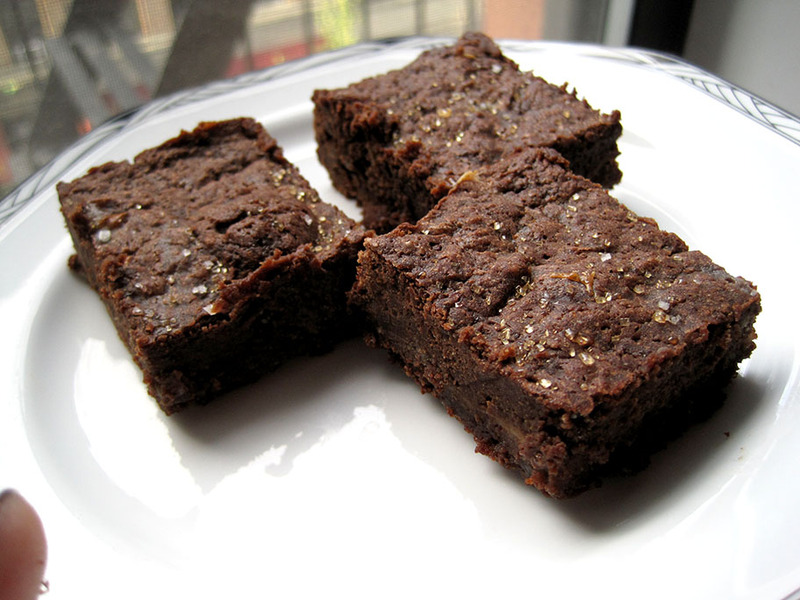 This brownie recipe is the strongest I’ve seen in a while, and will likely go in the hall of fame for being a delicious combination of flavors and textures that are irresistible to me. When I was making the recipe, I was at first a little suspicious. Why is there more chocolate than there is butter? There’s just as much sugar as butter! And one whole TABLESPOON of vanilla? That’s crazy! But I persevered and made the recipe as it is and I did not regret it. Firstly, the smell of this is intoxicating. It has the woodsy fragrance of bourbon and vanilla, without an alcoholic bite. It also smells a little comforting like a cup of coffee, even though there’s no coffee in it and I don’t even drink coffee. (But I can appreciate the scent memory it holds for most people.) Be sure not to overbake the brownie, but you don’t have to worry about the brownie not holding together because when the chopped chocolate solidifies, it’ll hold everything together. 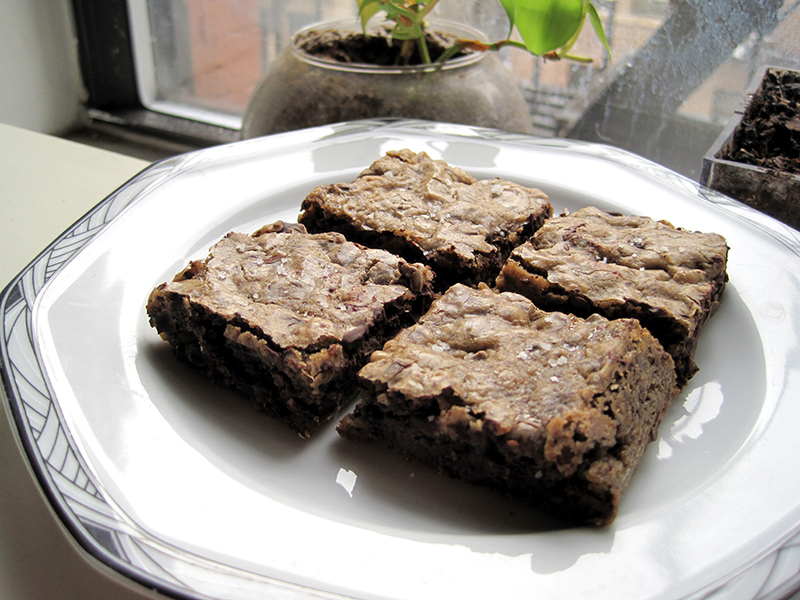 It’s less a cakey brownie than a chewy, dense one with crunch from the chopped chocolate and, so keep that in mind depending on what you’re looking to make. The sprinkling of fleur de sel on the brownies isn’t necessary, but it does heighten the sweet, earthy, caramelly and woody flavor profile. Since the ingredients in this recipe are so simple, I highly recommend using good quality vanilla extract and chocolate. 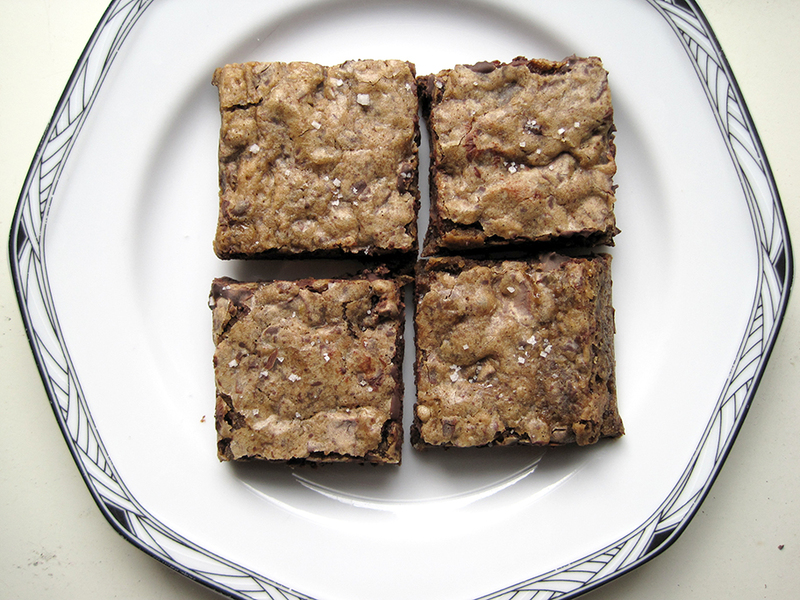 I used Trader Joe’s bourbon vanilla, and their Pound Plus Semi-Sweet Chocolate. You do NOT want to use chocolate chips in this once, since it’ll throw off the texture. Take the effort to chop the chocolate, and you’ll be rewarded with craggy, crunchy chocolate bits with a chocolate-flavored batter. Heat the brown sugar and butter together in a saucepan until the sugar is melted into a gooey mass with the butter, stirring occasionally. Let cool. Whisk flour and baking powder together, and set aside. Add egg, vanilla, salt, and bourbon to the cooled butter mixture, and beat together. Stir in the flour, and then the chocolate, until just combined. Spread batter in the pan, and bake 18-22 minutes, until light golden brown, and a tooth pick comes out clean, being very careful not to over bake. Sprinkle with fleur de sel. Let cool in the pan, then carefully lift sling from the pan and cut into squares. I wanted to get back into my baking groove, and instead of being paralyzed by the wide variety of recipes at my disposal, I decided to keep it sweet and simple: a bare bones shortbread recipe. It was also easy to shape – all I needed to do was press it flat with my hands and cut it up into little rectangles. Sometimes, even balling cookie globs can be quite tedious when all you want to do is just end up with a finished product. I’m actually really surprised by how tasty these are for the amount of effort. 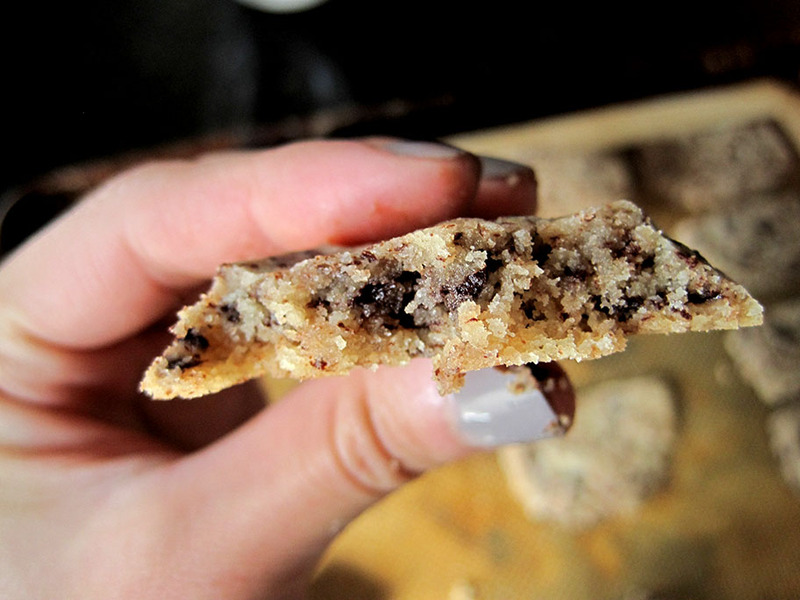 The texture is light and crumbly, and the cookies truly melt in your mouth. Taking care to actually shave a bar of semi-sweet chocolate down into little flakes adds so much more dimension to an otherwise standard-issue butter shortbread cookie – it fulfills chocolatey cravings but imparts more flavor than cloying richness to the cookie. The cookie is also on the salty side, so you may want to skip the coarse salt topping. Overall, this would make a great tea-time snack. Reduce mixer speed to low. Sift flour, add salt to flour, then add to mixture until just combined. Stir in chocolate. Dough will be crumbly but should hold together when pinched. If dough is not holding together, mix in 1 tablespoon water. Don’t be afraid to dig your hands in to mix it all up if it’s not coming together properly in the mixer.